Sup't John Grier Home, March 6. Dear Judy: I don't know yet whether the children are going to love me or not, but they do love my dog. No creature so popular as Singapore ever entered these gates. Every afternoon three boys who have been perfect in deportment are allowed to brush and comb him, while three other good boys may serve him with food and drink. But every Saturday morning the climax of the week is reached, when three superlatively good boys give him a nice lathery bath with hot water and flea soap. The privilege of serving as Singapore's valet is going to be the only incentive I shall need for maintaining discipline. But isn't it pathetically unnatural for these youngsters to be living in the country and never owning a pet? Especially when they, of all children, do so need something to love. I am going to manage pets for them somehow, if I have to spend our new endowment for a menagerie. Couldn't you bring back some baby alligators and a pelican. Anything alive will be gratefully received. To ask other readers questions about Dear Enemy, please sign up. Dear Enemy is the sequel to Jean Webster's novel Daddy-Long-Legs. First published in 1915, it was among the top ten best sellers in the US in 1916. The story is presented in a series of letters written by Sallie McBride, Judy Abbott's classmate and best friend in Daddy-Long-Legs. Among the recipients of the letters are Judy; Jervis Pendleton, Judy's husband and the president of the orphanage where Sallie is filling in until a new superintendent can be installed; Gordon Hallock, a wealthy Congressman and Sallie's later fiancé; and the orphanage's doctor, embittered Scotsman Robin 'Sandy' MacRae (to whom Sallie addresses her letters: "Dear Enemy"). Webster employs the epistolary structure to good effect; Sallie's choices of what to recount to each of her correspondents reveal a lot about her relationships with them. Dear Enemy is the 1915 sequel to Daddy-Long-Legs, a delightful if slightly flawed 1912 book. This book is, sadly, much more flawed, because of a running discussion of eugenics that probably seemed exciting and timely when this book was written but now comes across as, at best, wincingly dated. Our main character, Sallie McBride, was a minor character in the first book. In this one, Judy, the heroine of Daddy-Long-Legs, convinces Sallie, her best friend from college, to accept the job of running t Dear Enemy is the 1915 sequel to Daddy-Long-Legs, a delightful if slightly flawed 1912 book. This book is, sadly, much more flawed, because of a running discussion of eugenics that probably seemed exciting and timely when this book was written but now comes across as, at best, wincingly dated. Our main character, Sallie McBride, was a minor character in the first book. In this one, Judy, the heroine of Daddy-Long-Legs, convinces Sallie, her best friend from college, to accept the job of running the orphanage where Judy grew up. Sallie swears it's only temporary, because she has other plans for her life. But life has a way of happening and children have a way of worming their way into your heart. Dear Enemy, like Daddy-Long-Legs, is an epistolary book; it's made up of Sallie's letters to several people, mostly Judy, Sallie's on-and-off boyfriend Gordon, and Dr. Robin MacRae, the local doctor who takes an interest in the orphanage and is the "Dear Enemy" of the title. He and Sallie get into a lot of disagreements. Parts of Dear Enemy rate 5 stars: Sallie is funny and engaging, and I loved reading about the orphanage, the lives and exploits of the children and workers there, and Sallie's heroic efforts to improve life for her charges and to expand her own horizons. Sallie has some great, insightful comments about life. Parts of it rate 3 stars: the love story is undercooked and the ending too abrupt for me. Parts of it rate 1 star: Sallie has these periodic discussions about eugenics with Dr. MacRae, who favors it, which threw me out of the story every time, in a very unpleasant way. Eugenics ― the idea of improving the human races through selective breeding, encouraging reproduction by those with higher intelligence and other valued qualities, and discouraging or even preventing reproduction by undesirable people, like criminals and the mentally or physically handicapped ― was a serious philosophy in the early 20th century when this book was written. It fell into social disfavor only after the Nazi regime showed how far this could sink, and now these ideas are deeply repugnant and disturbing. Whether you'll enjoy this book overall depends on whether you can give this part ― which is a fairly minor but not insignificant piece of the story ― a pass and consider it in the context of the times when this book was written. It averages out to 3 stars, so that's where my rating is going to land. عدوّي اللدود هو العمل اللاحق لرائعة جين وبستر "صاحب الظل الطويل"، وقد نشرت لأول مرة عام 1915، وكانت من بين الكتب العشرة الأفضل مبيعًا في الولايات المتحدة لعام 1916. ومثل جزئها الأوّل، تتألف هذه الرواية من سلسلة من الرسائل، لكنها تُكتب هذه المرة بقلم سالي مكبرايد، الصديقة الأقرب لجودي آبوت، التي، كما سيتضّح للقارئ منذ البداية، عهدت إليها بمهمة إدارة ميتم جون غرير، لكي تتولى الإشراف على إصلاحه، والتخلص من السياسات القديمة التي جعلت من الملجأ مكانًا قاتمًا وكئيبًا. منذ حالة الهلع الأولى التي تنتابُ س عدوّي اللدود هو العمل اللاحق لرائعة جين وبستر "صاحب الظل الطويل"، وقد نشرت لأول مرة عام 1915، وكانت من بين الكتب العشرة الأفضل مبيعًا في الولايات المتحدة لعام 1916. منذ حالة الهلع الأولى التي تنتابُ سالي مكبرايد لتوليها المهمة وحتى نهاية العمل، يتتبع القارئ، بإلهامٍ وشغف، القوة الأنثوية الناعمة وتأثيرها في إعادة صياغة الذات والعالم. هذه رواية عن النمو، والتغيير، والمبادرة، وإنقاذ العالم بسلسلة خطواتٍ صغيرة تتحرك في الاتجاه الصحيح، وبقدر ما سنرى ميتم جون غرير ينمو إلى مكان مفعم بالضوء، سنرى مديرة الملجأ الصغيرة، سالي مكبرايد، تتحوّل من فتاةٍ مرفهة باهتماماتٍ سطحية، إلى امرأة ناضجة ومديرة تنفيذية قديرة. هذه رواية ملهمة، نحتاجُ كلنا أن نقرأها، لكي نتذكّر مكاننا الصحيح في العالم ونتصرّف على أساسه. ولكن أكثر من يحتاج قراءتها هم الشباب، لأنه سيكون رائعًا جدًا، أن نذهب إلى المستقبل بيدين بارعتين وعقلًا حسن الاستعمال، فهذا العالم الذي نوجدُ فيه يحتاج إلى كثيرٍ من الأيادي والعقول، على طريقة سالي مكبرايد. Eugenics, oh dear, oh dear. This book has all sorts of dodgy stuff in that can be overlooked a bit - but not completely! - by always keeping the mantra, "This was written almost a hundred years ago," going in your head while you're reading. I would give it five stars - on the whole, I like this one more than Daddy-Long-Legs, which it comes after - but alas! It is really quite dodgy to a reader now. But for everything else that is not dodgy, I only have massive amounts of love. As an epistolary no Eugenics, oh dear, oh dear. This book has all sorts of dodgy stuff in that can be overlooked a bit - but not completely! - by always keeping the mantra, "This was written almost a hundred years ago," going in your head while you're reading. I would give it five stars - on the whole, I like this one more than Daddy-Long-Legs, which it comes after - but alas! It is really quite dodgy to a reader now. But for everything else that is not dodgy, I only have massive amounts of love. As an epistolary novel, I think this works better than Daddy-Long-Legs. That is only concerned with Judy's one-sided correspondence with her mysterious benefactor. I like better in this book that we see Sallie's letters to more people; 'tis interesting to see how her style changes and evolves with all of them, and what she tells and omits to each. The romance is better here too, as a) they have a relationship of equality and mutual respect and b) I adore both parties instead of just one as in Daddy-Long-Legs. And I do adore Sallie. She is both frivolous and hard-working, and I approve of this. Loveliness!
" أود أن أطلب منك أن تصف لنا الزرنيخ علاجا لزكام لوليتا إني اكره تسميم الطفلة ولكن ماذا أفعل "
" لماذا لا يرسل الرب الرحيم أيتاما لهم عيون زرقاء وشعر أشقر "
سالی مک براید دوست جودی ابوت در کتاب بابا لنگ دراز نقش اصلی این کتاب رو به عهده داره و نامهها از زبون اون هستن. صد صفحه اول و صد صفحه آخر کتاب دشمن عزیز رو خیلی زیاد دوست داشتم. با غر زدنهای بامزه سالی به خنده میفتادم و کنارش شاهد رشد کردنش بودم! تو دغدغههای سالی خیلی وقتها خودم رو پیدا میکردم و این آینهای که مجسم میکرد برام خیلی لذتبخش بود. کتابهایی مثل بابا لنگ دراز و دشمن عزیز که آدم رو به سمت ارتقا دادن خودش هدایت میکنه و ذرهبین چشمامون رو از مشکلات زندگی دور میکنه خیلی دلچسبن و بیشتر با سلیقه سالی مک‌ براید دوست جودی ابوت در کتاب بابا لنگ‌ دراز نقش اصلی این کتاب رو به عهده داره و نامه‌ها از زبون اون هستن. صد صفحه اول و صد صفحه آخر کتاب دشمن عزیز رو خیلی زیاد دوست داشتم. با غر زدن‌های بامزه سالی به خنده میفتادم و کنارش شاهد رشد کردنش بودم! تو دغدغه‌های سالی خیلی وقت‌ها خودم رو پیدا می‌کردم و این آینه‌ای که مجسم می‌کرد برام خیلی لذت‌بخش بود. کتاب‌هایی مثل بابا لنگ دراز و دشمن عزیز که آدم رو به سمت ارتقا دادن خودش هدایت می‌کنه و ذره‌بین چشمامون رو از مشکلات زندگی دور می‌کنه خیلی دلچسبن و بیشتر با سلیقه‌ی من جورن! چه آرامش و صفایی دارد که بتوانی کاری را به کسی محول کنی و مطمئن باشی که آن کار به خوبی انجام می‌پذیرد. آیا مردها خنده‌آور نیستند؟ وقتی می‌خواهند برای تعریف از تو آخرین زورشان را بزنند، با ناشیگری به تو می‌گویند که یک مغز مردانه داری! معلوم است که من نمی‌خواهم کم‌کم از تو دست بکشم. این رسم من نیست. اگر بخواهم از تو به کلی دست بکشم، با طور ناگهانی و با یک جهش سریع خواهد بود! من که طاقت تجسم چیزهایی را که بعضی از بچه‌هایمان در زندگی دیده و تجربه کرده‌اند ندارم. سال‌ها آفتاب و شادی و محبت لازم است تا خاطرات ملال‌انگیزی که در زوایای دوردست مغزهای کوچک‌شان جا گرفته، ریشه‌کن شود. من از یک تغییر و تحول شدید بیزارم و ازدواج یک دگرگونی بنیانی است که عمری وبال گردن است. فکر می‌کنم می‌توانم تا ابد عاشق مردی بمانم که همیشه لباس سفید می‌پوشد. ننگ‌آور اینجاست که به نظر می‌رسد یک مرد نمی‌تواند برای من کافی باشد. من احساسات متنوع را دوست دارم که آن هم فقط از انسان‌های مختلف به دست می‌آید. متأسفم که جوانی‌ام بیش از حد به سبکسری گذشته، طوری که دیگر برایم آسان نیست یک جا بند شوم. هر روز آن‌قدر چیزهای جدید یاد می‌گیرم که هر شنبه شب به سالی شنبه پیش نگاه می‌کنم و از نادانی او حیرت زده می‌شوم. هرچه بیشتر از عمرم می‌گذرد، بیشتر مطمئن می‌شوم که شخصیت یک مرد تنها چیزی است که می‌توان روی آن حساب کرد. ولی تو را به خدا شخصیت مرد را چطور می‌شود شناخت؟ همه آن‌ها در حرف خیلی خوب‌اند. I have great love for this novel. I read it first as a teenage girl and since then, I have read it many times and each time, I enjoy it immensely and close the book with a big smile on my face. Dear Enemy is a sequel to the famous novel "Daddy Long Legs" and is told in a sequence of letters from Sallie to different people, mostly Judy. I have to say that I love this story more than the first novel.In my opinion, Dear Enemy is far more interesting, humorous, lively and romantic compared to the fir I have great love for this novel. I read it first as a teenage girl and since then, I have read it many times and each time, I enjoy it immensely and close the book with a big smile on my face. 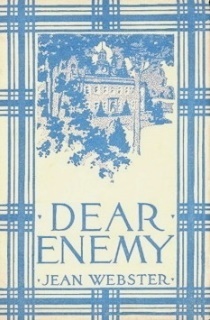 Dear Enemy is a sequel to the famous novel "Daddy Long Legs" and is told in a sequence of letters from Sallie to different people, mostly Judy. I have to say that I love this story more than the first novel.In my opinion, Dear Enemy is far more interesting, humorous, lively and romantic compared to the first novel. Keep an open mind while reading and remind yourselves that this story has been written decades ago and simply skim through any outdated opinions and comments you may find. At the time of this story, women-right activities were just beginning to form and societies were taking great steps forward and despite anything you may find outdated, this story happens to support feminism in a very good way. The first novel concentrates on women's right to educate while this one is about a woman's journey to independence and finding her own place in society not who and what she is SUPPOSED to be. Sallie isn't a very important character in the first novel but after reading this, I came to love her more than Judy. She is officially my most favorite red-head. She is kind, hard-working, funny and a wonderful woman in general. She also has quite a temper, a characteristic that she shares with her "Enemy"! Sallie is a wonderful writer and her letters to her "Enemy" are my favorites! While reading this book, anything remotely related to her relationship with her "Enemy" gives me great joy. I call THIS romance! "Enemy" is just as unique as Sallie herself and together they make one great funny couple. There are many characters that develop and grow through the story as Sallie grows into her realself and finds confidence. Many of children are memorable and the book portraits the characters in many different shades rather than just black and white. Huge swathes of charming, with one egregious, icky icky caveat. I do love me a good epistolary novel, and this one is splendidly done, with a light touch on what the narrator says and what the author wants to happen. 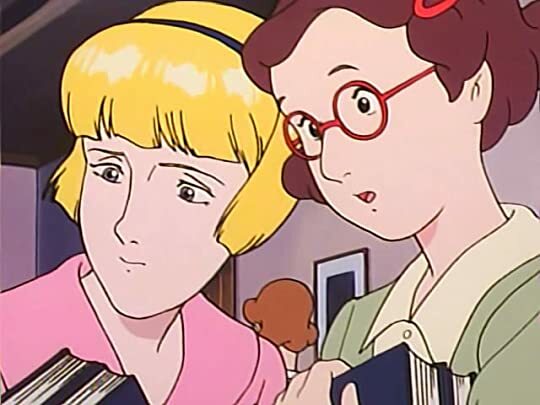 I find Sallie a slightly less dense narrator than Judy (heroine of the prequel Daddy Long Legs), whose greatest charm and irritation is her cheerful, persistent earnestness. Sallie is always a bit more self-aware, even when she's the silly socialite being badgered into working, and Huge swathes of charming, with one egregious, icky icky caveat. I do love me a good epistolary novel, and this one is splendidly done, with a light touch on what the narrator says and what the author wants to happen. I find Sallie a slightly less dense narrator than Judy (heroine of the prequel Daddy Long Legs), whose greatest charm and irritation is her cheerful, persistent earnestness. Sallie is always a bit more self-aware, even when she's the silly socialite being badgered into working, and I appreciate that. No surprises here; everything unfolds exactly as you think it will, but it's a neatly crafted little story. What I especially like about both this novel and its prequel are their sneaky, steadfast feminism. The first book is all about women's education in the early 1900s; this one is all about women's work. Yes, yes, product of their time, all about women in "appropriate" roles as writer and mother-to-113-babies-as-orphanage-director, but it's still there. The ideas are still being raised. Women's independence and capability of learning and managing and doing are never in question. برای روزایی که دنبال یه کتاب ساده، بی تکلف، کم تنش و دلنشین بودم، بهترین انتخاب بود. محتوای قشنگش رو با نثر روون و طنز خوشمزه اش یکجا بلعیدم و نوش جونم شد. شاید سرنوشت و آخرعاقبت جودی برای خیلیا رویایی و حسرت برانگیز باشه اما راستش من به چیزی که برای سالی اتفاق افتاد بیشتر غبطه میخورم و شاید به همین خاطره که این کتاب انقدر بهم چسبید. مواجه شدن با چالشی که کمترین درک و شناختی ازش نداری و بزرگ شدن و رشد در بستر اون و شکوفا کردن استعدادها و توانایی هات میتونه رشک و تحسین من رو همزمان برانگیخته کنه. برای روزایی که دنبال یه کتاب ساده، بی تکلف، کم تنش و دلنشین بودم، بهترین انتخاب بود. محتوای قشنگش رو با نثر روون و طنز خوشمزه اش یکجا بلعیدم و نوش جونم شد. شاید سرنوشت و آخرعاقبت جودی برای خیلیا رویایی و حسرت برانگیز باشه اما راستش من به چیزی که برای سالی اتفاق افتاد بیشتر غبطه میخورم و شاید به همین خاطره که این کتاب انقدر بهم چسبید. مواجه شدن با چالشی که کمترین درک و شناختی ازش نداری و بزرگ شدن و رشد در بستر اون و شکوفا کردن استعدادها و توانایی هات میتونه رشک و تحسین من رو همزمان برانگیخته کنه. هرچند یه جاهایی پیش خودم میگفتم چه خوب که ثروت بی پایان پندلتون ها هست که سالی برای اجرای ایده ها و به ثمر رسوندن کارهاش لااقل نگرانی مالی نداشته باشه ;) در مسیر این رشد و بلوغ، دغدغه های تربیتی بچه ها و مشخصا بچه های یتیم، قرار گرفتن در یک رابطه و الزاماتش و همه فراز و نشیبهای خوب و بد احساسی و خستگی های روحی و جسمی خیلی درست و قشنگ و دلچسب از زبون شیرین و ذهن باز سالی روایت میشد. دغدغه هایی که اکثرشون بعد از صدسال هنوز در جامعه ما محوریت و موضوعیت داره مثل ماجرای ازدواج هلن! First published in 1915, DEAR ENEMY is a sequel to Daddy Long Legs. Judy is now married and recruits her college friend Sallie to give up her happy-go-lucky life and run the John Grier Home, the orphanage that Judy was raised in. Sallie is getting bored waiting for her Congressman boyfriend to propose and agrees to take the job on a temporary basis. She turns up at the home with her kind heart, wicked sense of humour, her maid and her dog. She immediately falls foul of the home’s Scottish doctor First published in 1915, DEAR ENEMY is a sequel to Daddy Long Legs. 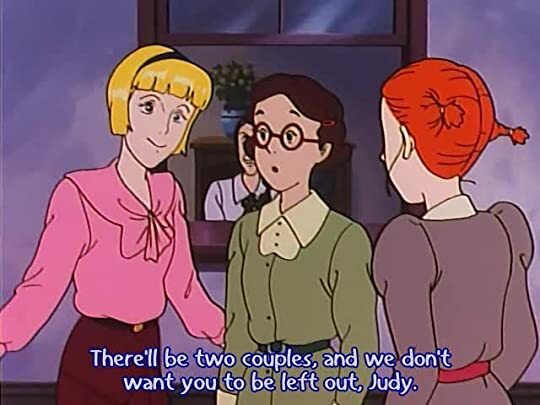 Judy is now married and recruits her college friend Sallie to give up her happy-go-lucky life and run the John Grier Home, the orphanage that Judy was raised in. Sallie is getting bored waiting for her Congressman boyfriend to propose and agrees to take the job on a temporary basis. She turns up at the home with her kind heart, wicked sense of humour, her maid and her dog. She immediately falls foul of the home’s Scottish doctor and a couple of the trustees who condemn her, sight unseen, as frivolous. As with ‘Daddy Long Legs’ the story is told in a sequence of letters from Sallie. They are mostly to Judy, but many are directed to the moody Scottish doctor–her "enemy". Sallie has a tendency to put her foot in her mouth – but she means well and has the welfare of her charges at heart. She has a goal to make the lives of the children happy; and to prepare them for working in the real world when they leave at sixteen. Her letters record her adventures with the kids (some of whom are a real handful); the loss of a series of cooks; convincing sexist trustees she is more than capable, and looking at her personal life without rose-coloured glasses. She also tells of neighbours who start of grumpy then all pull together when crisis strikes. During the course of the very quick read I laughed, I cried and I despaired – always the sign that I have been sucked into the story. Lots of conflicted thoughts on this one. I didn’t like it as well as DLL...mostly I didn’t like Sallie’s view toward the children, though that does improve to some extent. What was the biggest hurdle, though, was: “undesirable” children being parceled off to the “proper institutions” for deaf, epileptic, and so on—plus the doctor who believed implicitly in eugenics and heredity. I found all that very creepy, especially the part where a child too stupid for her own good was thought deserving of a Lots of conflicted thoughts on this one. I didn’t like it as well as DLL...mostly I didn’t like Sallie’s view toward the children, though that does improve to some extent. What was the biggest hurdle, though, was: “undesirable” children being parceled off to the “proper institutions” for deaf, epileptic, and so on—plus the doctor who believed implicitly in eugenics and heredity. I found all that very creepy, especially the part where a child too stupid for her own good was thought deserving of a treatment of arsenic for a mere cold...what? Hippocratic oath, anyone? The child wasn’t harmed, but the thought was expressed. كل ملاحظاتها واهتمامها بالميتم وتنوع قراءاتها وعملها الحثيث رغم كل المعوقات يعطي المرء دافعا قويا كي يجد في حياته مايحارب من أجله .. I think anyone who was interested in the story whether the anime, movies or book, would want to know what happened to Judy, Julia and Sallie. This story is written by Sallie this time, and her correspondence between herself and her friends and boyfriend Gordon (known as Bob to us), and Dr. Robin MacRae, her Dear Enemy! Had to re-read this, too, of course! I only found out recently that this book, a companion to Daddy Long Legs, existed at all, but, after reading Daddy Long Legs, I decided I better read it and I'm so glad I did. I think I'm glad, too, that I waited until now to read it. It's about Sallie, Judy's friend, taking over the running of Judy's old orphanage. And I think I appreciate it more than I would've had I read it when I first read Daddy Long Legs in high school. JUST. Seeing Sallie come into her own and fall for the orphanage and THE ROMANCE. I liked the romance in Daddy Long Legs, but this had that whole love/not really hate thing going on, which is right up my alley. When you read this book, FORGET ALL MENTION OF EUGENICS. It's terrible, but this is what you get for reading a book that's almost 100 years old. Not that that is any excuse, however. Other than that glaring concern (plus the subtle--but thankfully rare--cases of racism) (I'm really not selling this book well, am I? ), I love this book, even more than Daddy Long Legs. This is a wonderful journey of a woman learning to become more independent and self-assured, all while maintaining a sense of humor When you read this book, FORGET ALL MENTION OF EUGENICS. It's terrible, but this is what you get for reading a book that's almost 100 years old. Not that that is any excuse, however. Other than that glaring concern (plus the subtle--but thankfully rare--cases of racism) (I'm really not selling this book well, am I? ), I love this book, even more than Daddy Long Legs. This is a wonderful journey of a woman learning to become more independent and self-assured, all while maintaining a sense of humor about the world. I've read this book many times since my grandmother gave it to me years ago (although sadly, not the original copy--I had to buy a used copy of the 1991 reprint, and all page numbers are from that edition). Reading it recently, I was struck by how feminist and subversive (for the time period) it can be--all caveats aside, of course. And amid all this fantastic social commentary and character development, there's an equally matched romance, fun characters, and a good look at facets of American life before WWI. Even with the unfortunate eugenics mentions, I love this book--it's comforting and entertaining and never fails to perk up my spirits. و همين عبارت گول زننده است! چون اين كتاب شباهتى به آن رمان بابالنگ دراز ندارد. شخصيت محورى كتاب سالى مك برايد است. همه ى داستان به صورت نامه نگارى از زبانِ او نقل مى شود و تقريبا جودى در كتاب نقشى ندارد. ماجرا از اين قرار است كه جودى و جرويس مديرعامل نوانخانه ى جان گرير شده اند و مديريت آن را بر عهده ى سالى گذاشته اند و كل كتاب اتفاقاتى را ميخوانيم كه در آنجا رخ داده است. من معمولا از خواندن كتاب هايى كه به صورت نامه نوشته شده اند لذت ميبرم. طنز موجود در كتاب-خصوصا اوايل كتاب، وقتى سالى از پذيرفتن اين مسئوليت راضى نبود- به شدت دوست داشتنى بود! اواسط كتاب، خسته كننده بود و شور و اشتياق آدم را براى خواندن ادامه ى كتاب كم ميكرد! اما صد صفحه ى آخر فوق العاده بود! تا قبل از آن صد صفحه ى آخر، ميخواستم با منت زياد ٣ ستاره بدهم. ولى پس از خواندنش ٤ ستاره را با رضايتِ كامل دادم! چقدر عشقِ ميان سالى و آن دشمن عزيزش واقعى بود. عشقى كه نه در يك نگاه رخ داد و نه شخصيت هايش به طور اغراق آميزى جادويى و خوب جلوه داده شده بودند. عيب و ايراد هاى هر دويشان را در طول كتاب خوانديم و عاقلانه هم پايشان آمديم. ما داستان را از ديد سالى خوانديم و مانند او آرام آرام بزرگ شديم و عاشق شديم. راضى و خوشحالم از خواندن اين كتاب! probablemente esperaba bastante ya que el primero fue uno de los libros que lei antes de los 10 años y amé totalmente a Jerusa o Judy de hecho ni por aqui se me pasó quien era el " papaito piernas largas" me ha sorprendido y todavia me sigue sorprendiendo. la vision de Judy era hermosa , optimista y me dió esperanzas en mi sueño de escribir. este libro lo he leido de forma rápida aunque poseia una genial premisa no ha estado a la altura que su predecesor . yo recordaba a Sallie de una forma mas .... " amable" o mejor dicho la veia de forma mas elegante con su chispeante personalidad pero aqui habia cosas que me molestaron . me gustaria pensar que no me hubiera molestado hace 15 años atrás pero no lo creo. Sallie era digamos considerado menos femenina del grupo cuando era estudiantes , aqui ciertamente es como si intentara encajar para quedar bien ante Gordon ( un politico) . cuida a muchos niños que si , es muy trabajoso y la admiro porque amo tanto a esos niños como si fuera de ellos. 1.- es cuando dice que " las mujeres deben verse hermosas para que las adopte , es su unico atributo destacable"
2.- los niños de epilepsia u otra enfermedad que no me acuerdo son niños dañados y no deberia estar en el orfanato ocupado sitio. son defectuosos. y lo mas importante es que ella creia una cosa pero decia otra. como que sus palabras no iban acorde con sus acciones MENOS con sus sentimientos . el doctor Gordon me ha enamorado y eso que ya a mi edad son como piedra dura de roer. debe ser porque es mi tipo . del tipo que es gruñon , tierno con niños , lector , viejo, algo meditabundo , no muy hablador , de hecho no muy mentiroso tampoco . ¿ que mas se puede pedir? algunos personajes secundarios son digamos ni fu ni fa. divertidos pero nada memorable. los otros personajes , los niños son unas cositas tiernas que aveces necesita amor y también bañarlos con agua fria. pues este libro fue escrito de forma de carta. y aunque aveces se me hace facil u otras veces dificil siento que este libro no resaltó tanto con ese estilo , hubiera sido mejor desde la tercera perspectiva y no de Sallie porque soy sincera , no me agrado mucho Sallie. أنا حقا لا أدري ما معنى كلمة ( الصفح)، ولا يمكن لها أن تعني النسيان لأنه عملية طبيعية ولا تحدث حسب الرغبة. لدينا كلنا مجموعة من الذكريات التي نود أن ننساها بسعادة، غير أن تلك نوعا ما هي التي تصر على البقاء. وإن كانت كلمة الصفح تعني الوعد بعدم التحدث عن أمر ما ثانية، فيمكنني تدبر ذلك بلا شك. غير أنها ليست الطريقة الأكثر حكمة دوما أن تحبس ذكري حزينة داخلك، لأنها تكبر وتكبر وتجري في كل جسدك مثل السم. جميلة وآسرة وممتعة، وما الأدب سوى هذا الكم من المتعة. همه ی ما خاطراتی داریم که بهتر است شادمانه فراموششان کنیم.ولی دقیقا همان خاطرات هستند که به سیخ زدن اصرار دارند. اگر 《بخشیدن》 به مفهوم اینست که قول بدهی هرگز دوباره از چیزی حرف نزنی بدون شک می توانم این کار را بکنم.ولی راندن خاطره ای ناخوشایند به درون خودت همیشه عاقلانه ترین کار نیست.آن خاطره در وجود تو رشد می کند و بزرگ می شود و مثل سم به تمام بدنت می رود. دقیقا این کتاب به سبک بابا لنگ دراز نوشته شده ولی این سری مجموعه ای از نامه های سالی مک برایده.از خوندنش لذت بردم.ارتباط با بچه ها و نکات تربی همه ی ما خاطراتی داریم که بهتر است شادمانه فراموششان کنیم.ولی دقیقا همان خاطرات هستند که به سیخ زدن اصرار دارند. This was a cute story. A little bothersome sometimes (Sally would go on and on about Gordon, and I so detest him) but an overall enjoyable read. Percy was most likely my favorite character, I have a very strange habit of picking the minorest of characters to be my favorites, but ah well This was a cute story. A little bothersome sometimes (Sally would go on and on about Gordon, and I so detest him) but an overall enjoyable read. Sally was funny, and interesting and naive and rather unsuited for being superintendent, but she did her best and stuck to it and was surprisingly un-whiney, or at least, she was whiney, but she turned it always into a joke and stayed as lighthearted as possible. I liked her most of the time. She was less obnoxious than Judy was. So on the one hand, you have to admit, this is kind of a terrible book. The heroine speaks approvingly of eugenics, wishes (perhaps not jokingly) that a kid who poisoned himself on bad alcohol would be allowed to die because he carried a genetic predisposition towards alcoholism, and horribly insults people with disabilities. Yes, it was published in 1915, but how much do you let that excuse? On the other hand, though, I seriously love this book and the characters that emerge from it. I love Sal So on the one hand, you have to admit, this is kind of a terrible book. The heroine speaks approvingly of eugenics, wishes (perhaps not jokingly) that a kid who poisoned himself on bad alcohol would be allowed to die because he carried a genetic predisposition towards alcoholism, and horribly insults people with disabilities. Yes, it was published in 1915, but how much do you let that excuse? I love Sallie, who starts off a flighty, society girl and ends up maturing as she falls in love with the orphans under her care. I love how she does not become infatuated with all children because they are children, but these particular children because they need her. I love how she grows in her strengths. And though I do not recall previously loving Sandy or the other teachers at the orphanage, I found I liked them all here too. Webster does a great job swooping the reader up in Sallie's enthusiasm and showing it all through her eyes. And of course, I still adore Judy from Daddy-Long-Legs so any hints of her are lovely. Dear Enemy, thank goodness it didn't turn out how I thought it would! If it had I may have tossed you across the room in a fit of pique. Sallie was a dear redhead! Her fiery temper had me chuckling several times. And the grumpy Dr. Robin 'Sandy' MacRae was painted in such an affectionate light! I'm sorry I never liked Gordon, he was a sniveling pest who thought he was God's gift to women. Didn't like him a bit! I do rather wish I could have had just the tinnest of glimpses at Judy&Javises return letters but, oh well, I can get alone with just yours. In some ways I liked this better than Daddy Long Legs, but they are really quite different. I'll be rereading these sweet letters again, they have already taken a spot in my heart. به نحوی ادامه ی همان بابا لنگ دراز است اما با محوریت سالی.خب سالی دختر مهربانی است که زیاد به درد قهرمان بودن نمی خورد اما با این همه کتاب داستان خوبی دارد و خواندنش لذت بخش است. يادم نمياد كه بابا لنگ دراز رو هم همينقدر دوست داشته ام يا نه، ولى اين خييييلى خوب بود و حالم رو خوب ميكرد كلاً. نميدونم دارم اشتباه ميكنم يا واقعا همينطوره، اما كاملا حس ميكردم درباره زن ها خوب نوشته نميشه و حقيقتا از يه نويسنده زن تو اون دوره، كه قهرمان دو تا كتاب معروفش دخترها هستن، انتظار داشتم كه خيلى فمينيست باشه يا حداقل درك كنه اين مسا يادم نمياد كه بابا لنگ دراز رو هم همينقدر دوست داشته ام يا نه، ولى اين خييييلى خوب بود و حالم رو خوب ميكرد كلاً. So far, really boring. I also find it weird that she calls him Enemy to his face. I'm tired of people like Davie (Anne of Green Gables) and Punch (Dear Enemy) getting away with being brats - why is it that in these books the only way to get attention is to be obnoxious, obstinate, and irritating instead of nice and cute and normal? Davie and Punch are my least favorite characters in both books because of their everlasting tolerance for bad behavior. And really? They didn't know what money looked So far, really boring. I also find it weird that she calls him Enemy to his face. I'm tired of people like Davie (Anne of Green Gables) and Punch (Dear Enemy) getting away with being brats - why is it that in these books the only way to get attention is to be obnoxious, obstinate, and irritating instead of nice and cute and normal? Davie and Punch are my least favorite characters in both books because of their everlasting tolerance for bad behavior. And really? They didn't know what money looked like? This is really hard to believe. Oh guess what she's going to marry Dear Enemy. You can tell from the day she meets him who she's going to end up with. Gordon? MacRae? Oh please. Is that even a question.